As part of the national initative, American Graduate: Getting to Work, WHRO has been engaging with community partners in an effort to promote high-demand, skilled jobs that do not require a four-year degree. Through multimedia content and promotion, WHRO showcases the work being done to help students, parents, educators and businesses become aware of and connect with training, apprenticeships, resources and job searches to jumpstart a career. Recently the Southeast Maritime and Transportation (SMART) Center and the Girl Scouts of the Colonial Coast partnered together for the first annual Women Take the Wheel event. All of the girls registered for the event learned about skilled career opportunities in trucking, shipbuilding and repair, and the maritime industry. Participating community partners included Givens Trucking, Huntington Ingalls Industries and Newport News Shipbuilding, the US Army and US Coast Guard, Colonna’s Shipyard, Virginia Ship Repair Association, Tidewater Community College and the City of Virginia Beach Fire Department Station 18. 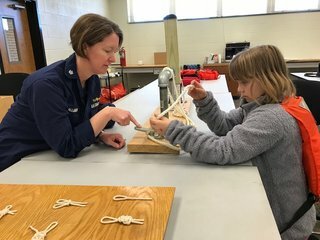 Girl Scout Brooke learns how to tie knots from CDR Maureen Kallgren. 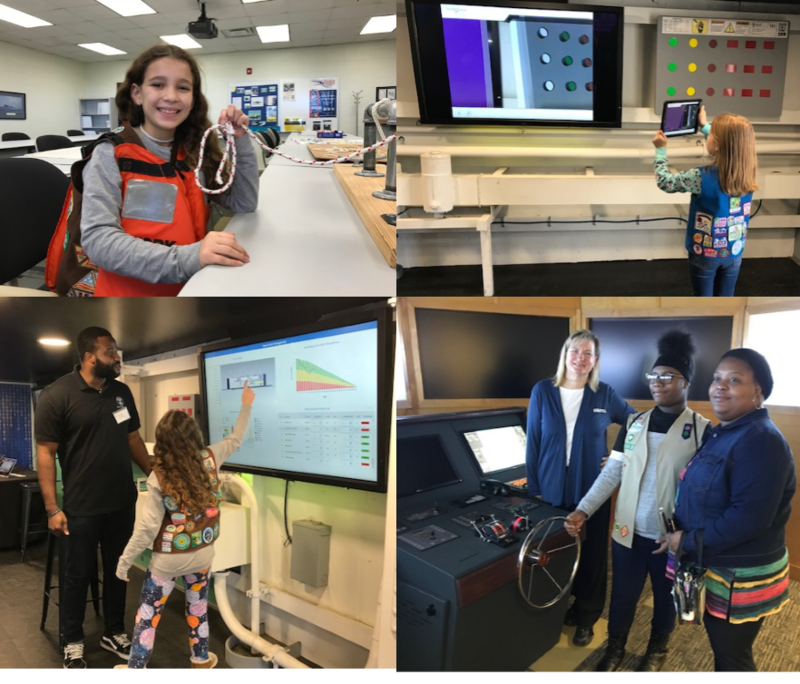 Girl Scouts attending were happy to get hands on at the various exhibits, learning how to tie knots with CDR Maureen Kallgren with the U.S. Coast Guard, and trying their hand at piloting a large vessel with Jennifer Palestrant of the SMART Center in the maritime simulator. According to the U.S. Department of Labor, women represent only 6.2 percent of truck drivers. The International Transport Workers Federation estimates only 2% of global seafarers are women. By continuing its work with area community partners, WHRO hopes to increase the number of women and individuals overall participating in skilled careers.